My heart lept into my throat when I saw Stephen Hillenburg. Maybe this movie will be good after all. I trust his judgment more than any other when it comes to the quality of this show. It's great to see Hillenburg. Hopefully he's pushing the crew in the right direction! He probably didn't. If you search Google Images for "Stephen Hillenburg" there really aren't that many photos considering he's the creator of such a successful show. He seems to be quite a private/humble person which is why we rarely get photos, videos, interviews etc. I don't think he looks particularly unhappy compared to other photos of him. Tired, maybe. But they are making a movie. Am I the only one who thinks Steve looks kinda unhappy? I think Mr. Hillenburg has more of a skeptical look on his face, he could be feeling skeptical about the success of the sequel, considering how much of (in his words) a "bloodbath" the original was. The first film opened at number 2 in the box office behind "National Treasure" in 2004. I wish I was there with the crew to help the movie. A girl can dream. ._. A prequel would be much better. Perhaps explaining how Spongebob and Patrick became friends would be a good idea. Or anything that isn't a direct sequel. I love this idea. The possibilities of where they could go with this are endless. Spongebob and Patrick meeting for the first time. Plankton and Krabs becoming enemies. Or Krabs opening the restaurant for the first time. Hell, even seeing Sandy make her decision to migrate to the sea would be pretty sweet. We could even see when Spongebob first adopted Gary. hmmmm? I wish we could seen the whole drawing that Paul Tibbit made. 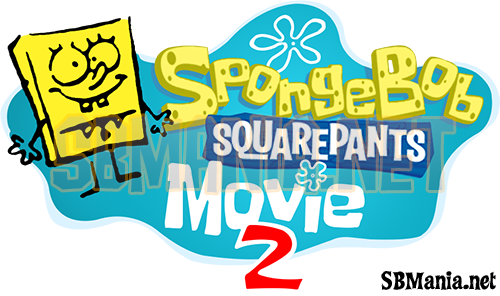 According to various tweets from the SpongeBob crew, they had the second animatic screening of the movie on Tuesday and it went well. Tuesday: second big animatic screening=upturned thumbs, success! Wednesday: bowling to celebrate...four frames in, I'm told to mark it zero. And a "plot spoiler" which is certainly a joke because it's the plot for "Race for Your Life, Charlie Brown". Will Plankton be able to steal the formula successfully? Will the formula be revealed? Will Spongebob finally get his license and Mrs. Puff will be nicer to Spongebob? Will Squidward be happier? A new character? What else?! Finally! I can't wait to see it!!! Is he burping out a Krabby Patty? Maybe looking at it in awe.